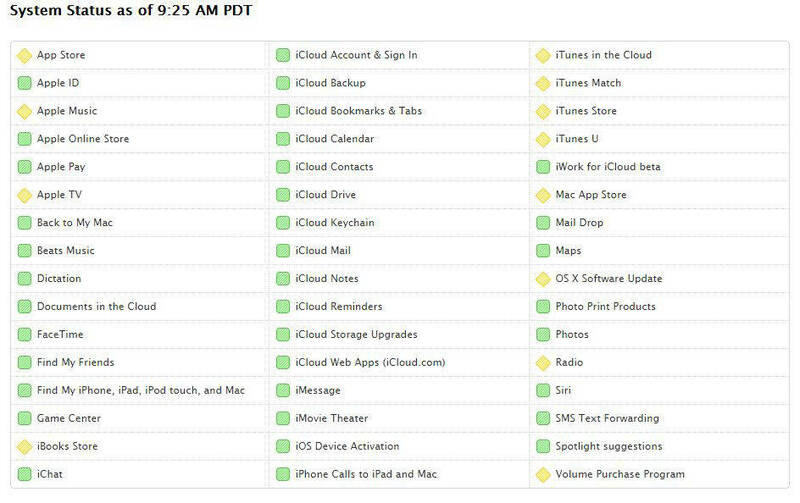 Updated Apple's web stores, music-streaming jukeboxes, and cloud services have been struggling to stay online for the past three hours. As of 0959 PT (1659 UTC), Apple's status page is still reporting partial outages for the iOS and OS X App Stores and Apple TV, as well as the iTunes services, Apple Music, and Radio. The systems fell off the internet just after 0630 PT (1330 UTC) today. Apple hasn't given a precise reason for the outage, other than saying: "Users are experiencing a problem with the services listed above. We are investigating and will update the status as more information becomes available." Apple reckons it was able to fix whatever was knackering its systems at about 1015 PT (1715 UTC) today.